This pull tab is perfect for using inside your home to clip to a prong collar for giving a correction. 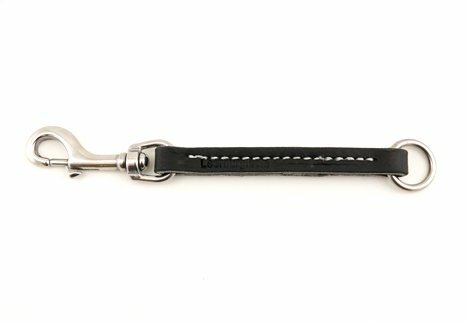 You don't have to have a long leash hanging from your dog's collar. The pull tab is large enough to grab quickly if the need arises, but small enough not to get tangled up in your dog's feet or to get caught on any furniture. The pull tab is 6" long and 1/2" wide with a snap on one end an and O ring on the other. It is made by Amish leather craftsmen from latigo leather. The pull tab has reinforced stitching for the highest level of security. If you have any questions about this product by Leerburg, contact us by completing and submitting the form below. If you are looking for a specif part number, please include it with your message.